This year, the folks at 2K Games have some nice surprises for those who purchase NBA 2K17, one of them being the Jump Shot Creator – a brand new and totally awesome feature that allows you just what the name suggests: to create your own, custom jumphots. And I am here to share with you a complete guide to the Create a Jump Shot feature in NBA 2K17, as well as some quick tips on the type of jumpshot that you create. 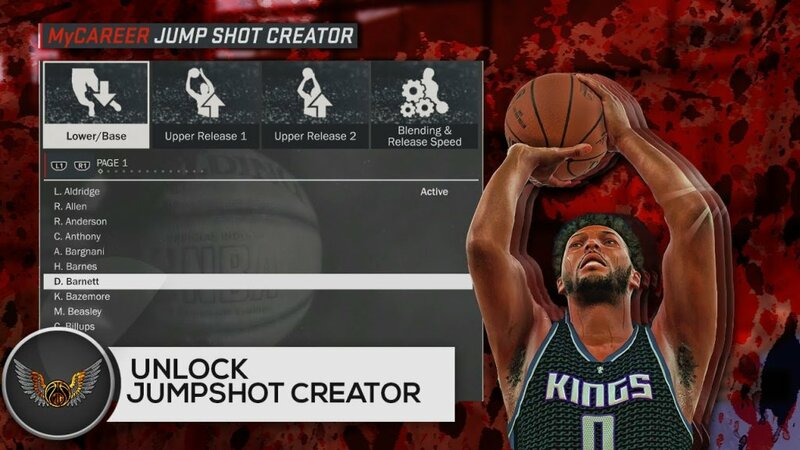 First of all, if you just started playing the game, you might be wondering how to unlock the Custom Jump Shot creator in the game! In order to access this feature, you need to get a text message from Coach K, an invitation to meet up with him and some other players. You have to accept this and soon afterwards your manager will have a text for you, saying that you’ve unlocked the Jump Shot Creator. Although many people claim that getting the message from Coach K is absolutely random, I think that you have better chances of triggering it after playing a few season games and doing as much Doing Work events in your free time as possible. OK… so now that you have unlocked the Custom Jumpshot creator in NBA 2K17, it’s time to actually put it to work and create the best shot animation for your player. If you’ve read our NBA 2K17 My Career tips, you know already that animations are extremely important in the game and some are better than others when it comes to the overall performance of your player. Therefore, creating the perfect jump shot is a huge advantage that you have in a game – or something that can turn in a big disadvantage if you make the wrong choices. Basically, you have to select three animation types: the base, upper release 1 and upper release 2. You also have the choice – which is really important – to set the blending and release speed. How does this work? You have shot animations from all the players in the game and you can mix them as you feel it’s right. You can get a base jump shot from Carmelo Anthony, the Upper Release 1 from K. Duckworth and the Upper Release 2 from another player. It’s your choice here and there are so many possible options that there’s no single right one. There’s two things that you should keep in mind though when doing this: make sure that the throws are good and easy to control (so that you can easily release at the right time) and adjust the blending and release speed bars in order to get a throw that’s difficult to block. With a bit of practice, you can create an extremely good shot that is all yours and helps you score more baskets than usual. So this would be our guide to the Jump Shot Creator in NBA 2K17. Make sure to use it to your own advantage!